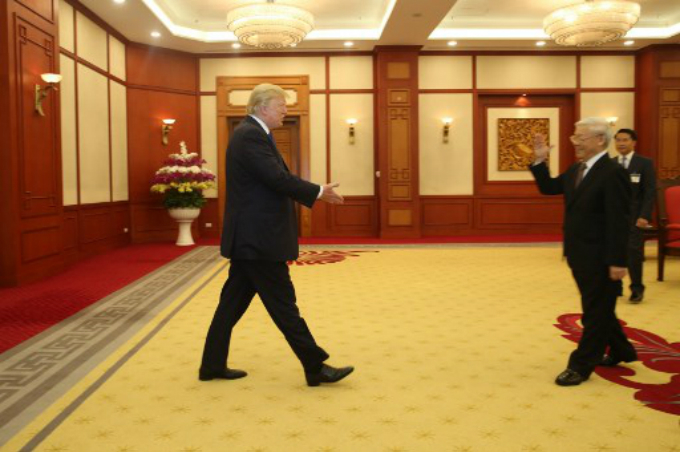 The U.S. president made it a hattrick of leaders after his meetings with President Tran Dai Quang as he bid farewell on Sunday morning. 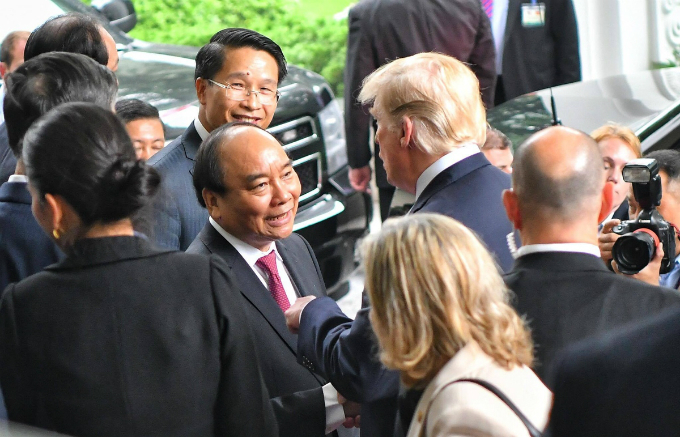 Trump bids farewell to PM Phuc as he left Hanoi, wrapping up his first state visit to Vietnam. 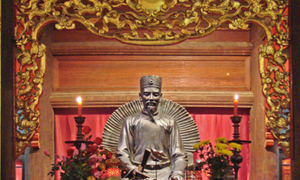 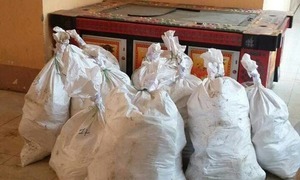 Photo by VnExpress. 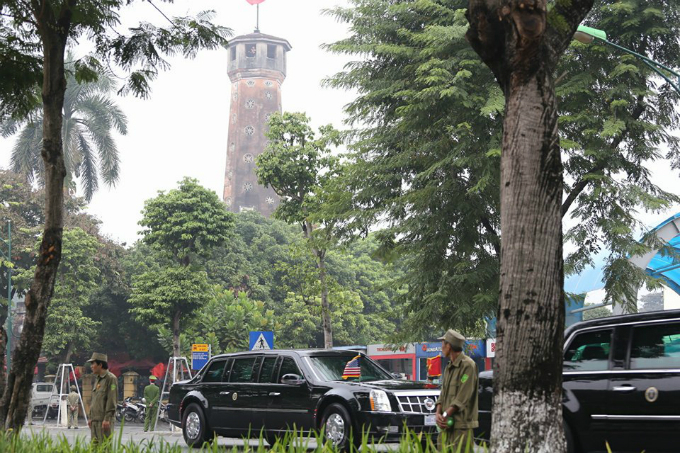 Hanoi's Flag Tower watches over as President Trump’s convoy leaves Vietnam’s presidential palace for Noi Bai International Airport, from where he will fly to Manila, the Philippines to attend the ASEAN Summit. 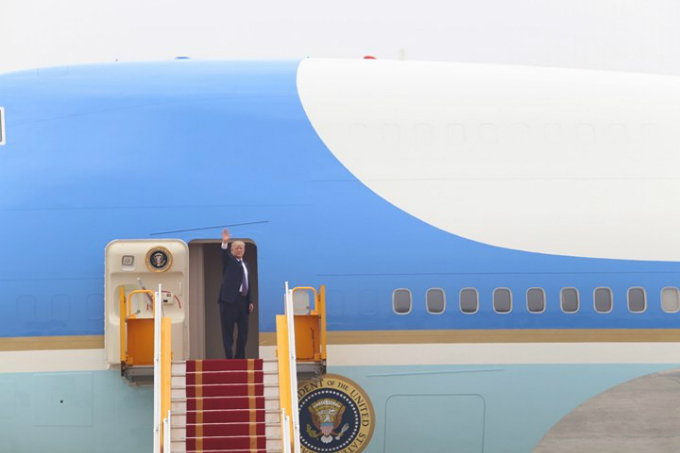 President Trump arrived for his first state visit to Hanoi on Saturday evening after attending the APEC Summit in Da Nang, around 800 kilometers (500 miles) to the south. 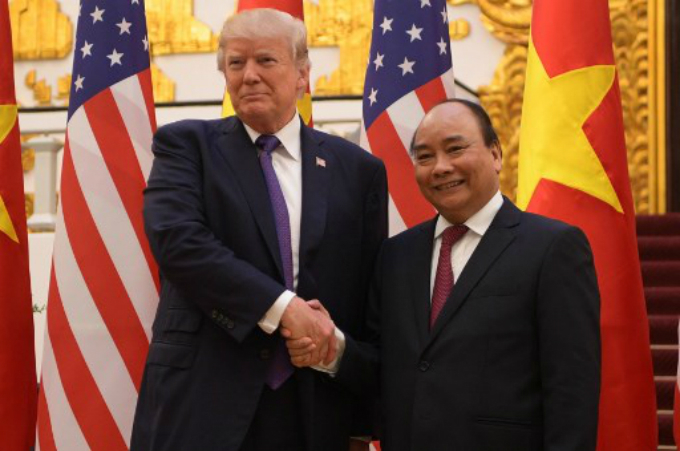 During a press conference held with his Vietnamese counterpart Tran Dai Quang on Sunday morning, Trump repeated his APEC speech theme of free Indo-Pacific trade relations, saying the U.S. is looking forward to “fair and reciprocal” bilateral trade with Vietnam. 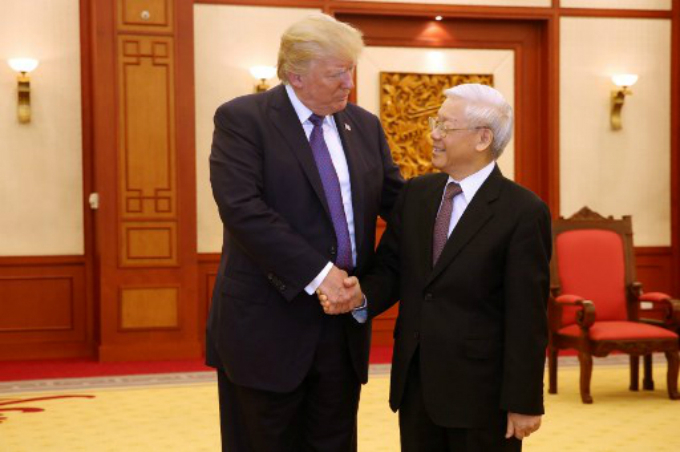 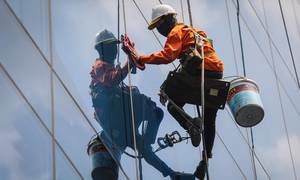 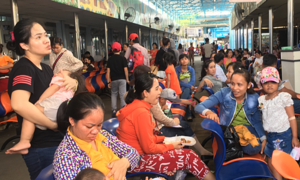 Vietnam is Southeast Asia’s biggest exporter to the U.S., and the U.S. trade deficit with Vietnam is a concern for Trump’s protectionism policy. 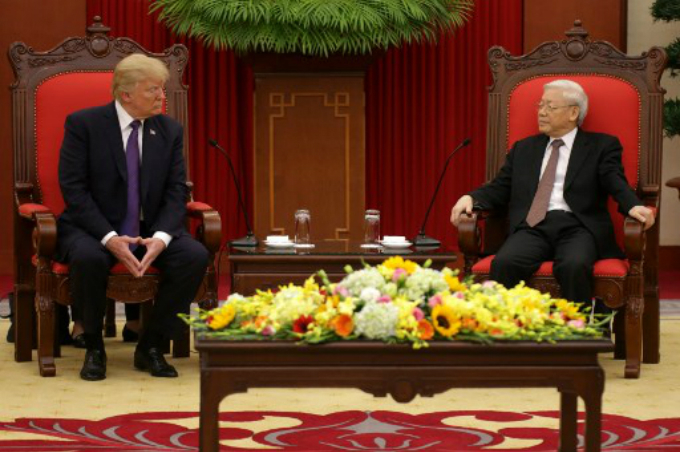 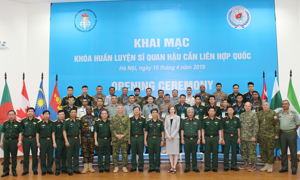 “The U.S. is enthusiastic about reforms that promote economic transparency for all in Vietnam” and about looking to “remove unfair trade practices in the region,” he said in Hanoi. 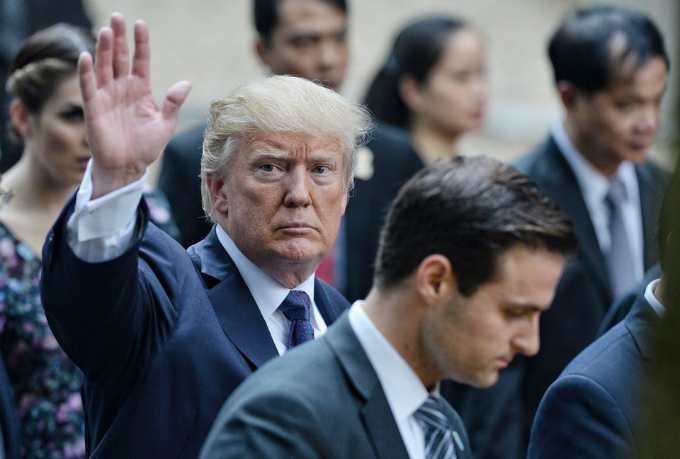 Vietnam is the fourth and longest leg of Trump’s 12-day Asia tour, the longest trip to the region made by an American president in more than a quarter of a century, which is aims to boost ties and seek support in counterating the nuclear threat from North Korea. 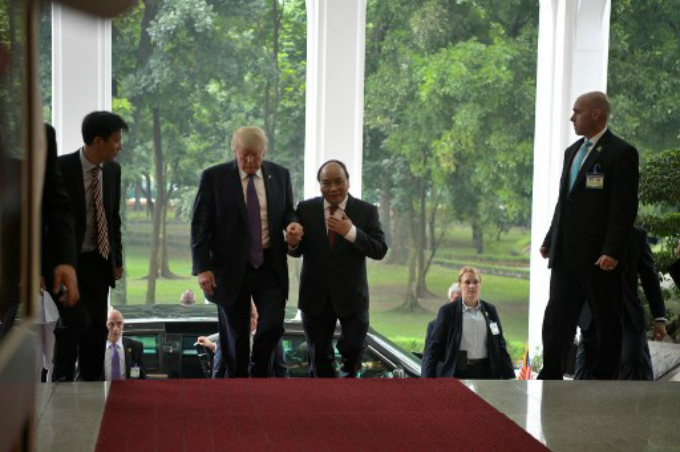 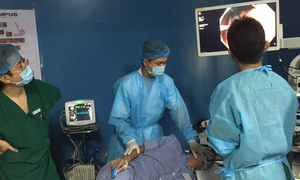 He visited Japan, South Korea, China before Vietnam, and will later head to the Philippines where he will attend a dinner to mark the 50th anniversary of the Association of Southeast Asian Nations (ASEAN) before celebrating the 40th anniversary of U.S.-ASEAN relations the following day.